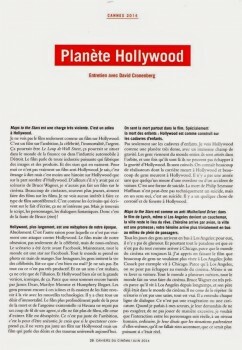 'Maps to the Stars' is on the cover of Cahiers Du Cinéma Magazine (France) - Features a long and interesting (and spoilery) interview with David Cronenberg - translated in this post - where he mentions Rob a few times and a new behind the scenes still. A child kills another near a urinal, it goes a long way … At the same time, the beauty of the movie is that it's 'for' children, to save the children. The character played by Mia Wasikowska is older but behaves like a child. She gathers children. Yes the main character is the sweetest, most naive, the purest even she's crazy. She isn't here to become a star but to solve a family trauma. Jerome's character played by Robert Pattinson is also a child. He isn't born in Los Angeles, he comes from Indiana and elsewhere, he believes that he is able to play the game. It's pathetic, he'll be destroyed like a child. He's too vulnerable. He plays the badass people but he doesn't. At the end, the children are destroyed by monsters. This is the new direction taken by the poem Liberté which was written by Paul Eluard at the time of the Resistance. Here, freedom is death. 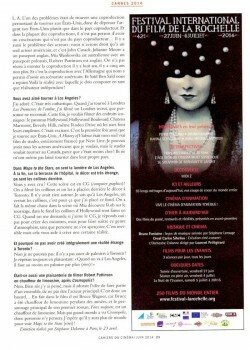 My movies are canadian-UK, Canadian-French or Canadian-German coproductions. I had to shoot at least five days in Los Angeles. We couldn't recreate Hollywood in Toronto, we had to shoot there, it's so special. We shot twenty four days in Toronto and five in L.A. One of the problems was to find a coproduction allowing to shoot in the States, and therefore spending money in the United States rather than in the coproducing country. 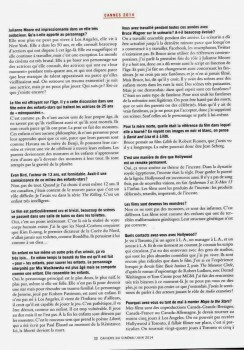 And in most coproductions, it's not possible to have a co writer which isn't from the coproduction country … There is also the problem of the actors : we were only allowed to have one American actor, and that's John Cusack. Julianne Moore has a British passport, Mia Wasikowska is Australian with a Polish passport, Robert Pattinson is English. We didn't manage to find a coproduction eight years ago or five years ago either. And this is the coproduction with Germany which allowed us to get an American screenwriter. And Saïd Ben Saïd joined us. Here is the reality with which I have to deal as an independent director ! You believed it? This scene is a CGI one! We shot the hills and we put behind the scenes in Toronto. There was nothing around. I know that in Los Angeles, we would see the hills, that's why I put this background. We did the same the thing in the scene where Mia discovers Rob on set, the Hollywood hills in the background are made in CGI. When people ask me if I like CGI, I say yes: not to create monsters, but to give birth to this kind of atmosphere without anyone noticing it. It's invisible but it helps to create a certain reality. No. Of course, I thought about it, but he loved the idea of being a part of an ensemble, not being the lead actor. So this is a chance … In fact, in the movie, he's Bruce Wagner, because Bruce was a limo driver for years, and the lead part in his first novel, Force Majeure, is a limo driver. But only a few people saw Cosmopolis, so nobody will think about it. I hope there will be more people going to see Maps To The Stars (laughs)! David Cronenberg : I don't only see the movie as a movie about Hollywood. This a movie about ambition, fame, immortality, money. It could be The Wolf Of Wall Street, it might be in the world of business or in the automobile industry in Detroit. The movie is about any industry that produces powerful pictures or products. And stars that are born because of that. For me it's not really an Anti Hollywood movie. I know it's strange to say but this is less a story about Hollywood as the dark side of Hollywood. Besides if there were not this script of Bruce Wagner, I wouldn't have made a movie about cinema. Many filmmakers, often younger ones, like to make movies about movies. I have no interest in this type of self-referential movie. It's like writers who write about writing, it doesn't interest me. But I found that the script, the characters, the dialogues were amazing. So it's Bruce's fault (lauhgs)! Absolutely. This is another reason why it's not really an attack against Hollywood. The movie talks with our obsession, not only the fame, but also of ourselves. The screenplay was written before Facebook. Now everybody is a star on Facebook. Everybody takes pictures while eating. On Instagram, people imitates the lives of celebrities. Is it good or bad? I don't know. In any case it's not very productive. And in a way it's unhealthy, it only creates the illusion. And Hollywood of course is the huge, iconic version of that. Because we're still haunted by James Dean, Marilyn Monroe and Humphrey Bogart. People still think about these icons and they try to bring them back to life with new technologies. There is in everybody a desire for immortality. The movie talks deeply about the fear of death and the existential dread : if Havana doesn't receive a call from her agent, if she doesn't make any movie, she ceases to exist. She is desperate. This isn't just ambition, it's the fear of being annihilated. I think that if the viewer understands that, he doesn't just see a movie about Hollywood but a movie about desires and universal traumas now. Not only on the bodies of children. I see Hollywood as a very dense planet, with a huge gravitational field. People come from all over the world, they are drawn into the orbit, and once they are there, they can't escape the gravity of Hollywood. They are stuck. We know many directors whose career died in Hollywood and many people die in Hollywood. There isn't a year without someone dies of an overdose or a car accident. It's a form of suicide. The death of Philip Seymour Hoffman isn't perhaps technically a suicide, but in a sense, yes it's a suicide. There is something corrosive and destructive in Hollywood. Maps To The Stars is like an anti Mulholland Drive ; in David Lynch's movie, even though Los Angeles is a nightmare, the city is the location of dreams. The heroin arrives by plane, the city is a promise; your heroin comes in a mundane way by bus amid lots of passengers. Every day people come by bus to Los Angeles; for them, there is no glamour. Yet the paradox is that it's not at all like arriving in Chicago, because the world of cinema is still there. I learned from making the movie that many people no longer wanted to live in Los Angeles: for example John Cusack lives in Chicago. Because in Los Angeles, you can't escape from the world of cinema. Even if you go wash your car. Everyone has several jobs, everyone is or wants to make movies. Bruce Wagner is very accurate because he lives in Los Angeles for a long time, and his father was in the world of cinema. He keeps repeating: the script isn't a satire, everything is true. He heard every line of the dialogue. It's not an exaggeration or a caricature. When I talked to my actors, I asked them not to exaggerate, not to play excessively, I wanted that the interaction between the characters is real, at a human level, ordinary. I told them that the situations speak for themselves, that they haven't to emphasize, that it would be more powerful if it was real. She neither can't live in Los Angeles, she lives in New York. She's in her fifties and she knows a lot of actresses who have disappeared in this age. She's beautiful and she continues to work, but this is an exception. The world of cinema is very brutal. She could base her character on actresses she knows, actresses who have had 'their time' during three or four years and which have disappeared because their lack of talent appeared or because they aged badly. We find an existential trauma : I'm an actress but I can't play anymore. Who am I? Do I still exist? The movie is scary about the age. There's this discussion in a party between child stars who treat 25 years old actresses of 'post-menopausal women'. It's like that. They have no sense of their own age, they don't know that they'll age and they are mortal. They're cruel because they're afraid. Fear makes monsters. These children have no philosophy, they have no one teaching them anything, because their parents are like Havana or Benjie's mother, they push their career and live a life of fame through their children. Parents become monsters and children learn nothing else but become monsters in their turn. They are caught by the gravity of the planet. No, not at all. When I chose him, he was even 12 years. He is Canadian, I was happy to find him because it's a difficult part. I had seen him in the TV show The Killing. This is a very intelligent child. You've worked during all these years with Bruce Wagner on the script ? Did it evolve a lot? We worked together for years. The script has been updated to the last minute because when we started working, Facebook, smartphones, Twitter didn't exist. And Bruce likes to use contemporary references. I first talked about the role to Julianne Moore eight years ago, so we had also to review the script based on age. And then I also made a change in ghosts. I don't believe in ghosts and I've never film them. But Bruce says that he believes in them. There were scenes of dead children in the streets at night. Very powerful scenes. But I was wondering : in which spirit are those ghosts? It was a different kind of ghost. For me only the ghosts of memory are legitimate. We can be haunted by the dead people, whether relatives or celebrities. But there are real ghosts, I can't accept it, so I removed these scenes. Except where the character talks to themselves. It's a way of saying that Hollywood is a permanent remake. No, they aren't monsters, they're disabled. It's different. Movies are like children who have terrible genetic defects. Their genetic structure isn't correct. I live in Toronto, I have an agent in L.A. and a lawyer in L.A. and they keep me informed. I know the scripts that are circulating. I had meetings with people from studios, which are the most absurd comedies that I could live. They're even more ridiculous than in the movie. I have had experienced it when I had to do Basic Instinct 2, then The Matarese Circle based on Robert Ludlum's spying novel with Denzel Washington and Tom Cruise for MGM. I made very very odd encounters that time. I can't tell you more, I couldn't believe what I was hearing. I felt talking to actors playing the role of studio executives! I loved it. It was very cathartic. When I shot Eastern Promises in London, I shot a secret London that nobody recognizes. This time, I wanted to shoot iconic places: the Hollywood Sign, Hollywood Boulevard, Chateau Marmont, Beverly Hills, even Rodeo Drive where the stars do their shopping. It was exciting. It was the first time I shot in the United States. A History Of Violence was my only real movie studio, fully funded by New Line. I could have all the American actors that I wanted, but the studio wanted to shoot in Canada because it was cheaper! They didn't even let me shoot in their own country.